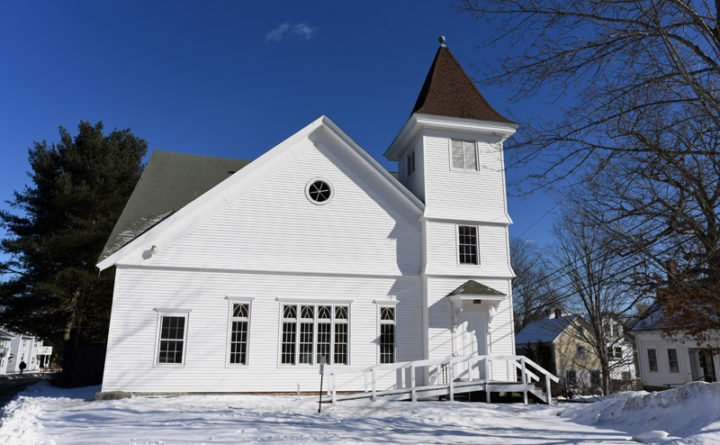 The Damariscotta United Methodist Church, at 40 Church St. in Damariscotta, is for sale. The congregation and the church-hosted pet food pantry plan to move to another space. The Damariscotta United Methodist Church, at 40 Church St., is for sale and currently under contract. The congregation and the church-hosted pet food pantry plan to move to another space or spaces. Drum & Drum of Damariscotta is listing the property. Bonnie Stone, a broker with the agency, confirmed that a contract has been signed. She said a sale may not be final for a few months. Built in 1870, the 4,032-square-foot church is listed for $175,000. “Many possible options for use include repurposing as a residence with bright studio space [or] perhaps a school or multi-unit condos/apartments, with town approval,” the listing states. “This will relieve a small congregation of the responsibilities of facility care as they grow older,” Munson said. “The congregation will move to alternate space for worship, continuing to be led by its rotation of gifted preachers from the area. Harvell said the congregation is in the process of finding a new location for worship. Munson said the church is actively seeking a new location to house its pet pantry outreach. The congregation and pantry may end up in separate spaces. Until the building sells, worship and pantry operations will take place there as usual, according to Harvell.